On Sunday, February 19, 2012 at 2:44 PM, Engine 1 and Ladder 1 were dispatched to an automatic fire alarm sounding at 601 West Main Avenue (Chase/Washington Financial Center). When the companies arrived and made contact with occupants, they were told of smoke on the upper floors of the 15-story building. 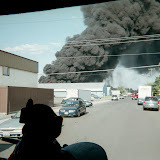 The company officer upgraded the incident to a working fire which added six additional companies of Spokane Firefighters; including 4 Engines, 2 Senior Ladders and 1 Heavy Rescue under the direction of Battalion Chiefs Green and Fielder. While the full alarm was responding, Firefighters from Engine/Ladder 1 were assembling equipment (high rise hose kits, SCBA bottles and tools) to carry to the fifth floor and prepare for an offensive fire attack. The South Battalion Chief arrived quickly, established command and based on Spokane County's High Rise Guideline, upgraded the incident to a 2nd and subsequent 3rd Alarm to bring the number and types of resources needed to fight the fire safely. Unfortunately, the building was constructed before a fire suppression system (sprinkler system) was required for all floors. In this case, the fire suppression system present only protected the basement and did not protect any of the other floors. As companies arrived, the incident commander assigned them to support the fire attack on the 6th floor. Early arriving Engine Companies were utilized to support the building's standpipe system to aid the fire attack while Ladder Companies were assigned to search the building's 15 stories to ensure no one was in need of rescuing; as well as tactically ventilating the building. As per policy, Chiefs took control of the building's internal safety, communications and ventilation systems to assist with the fire attack. Firefighters rapidly made their way through the light smoke on the lower floors and up the stairwells to floor 5 where the attack was assembled. A working fire was located by fire attack teams in offices on the 6th floor and was quickly extinguished in just 20 minutes. Several fire companies spent a significant amount of time overhauling and protecting contents with tarps and controlling water runoff from the fire's extinguishment. There were no civilian or firefighters injured as a result of this fire. There was significant content damage to an IT room and adjacent office. The structure's integrity does not appear to be impacted.